Solution for companies with subsidia.. The attendance system is used for registration of attendance, monitoring of movement of employees during working hours and preparation of inputs for wages agenda processing. The system is used to control access rights of individuals into specific parts of the company with a visualisation option. The system is a comprehensive software for wages and HR agenda processing, created for the calculation of all types of wages. The system is used for the registration of personal data of employees and applicants. You can plan the number of employees needed in a given time and their recruitment, etc. We offer a solution for meal ordering with the same ID media used for registration of attendance. The boarder thus uses a single ID medium for a number of actions. D-Station is a big leap forward in the field of biometric technologies. It represents a perfect connection of face recognition and two-finger scanning based on a sophisticated unification of biometry and unbelievable accuracy and speed. No other biometric appliance can compete with D-Station. It is equipped with a Tri-CPU processor which secures a flawless operation of demanding innovative functions and an ultra-wide touch LCD screen with intuitive control. D-Station is very easy to use for both the system administrators and everyday users. D-Station is not only the best in its category, but also represents a brand new generation of biometric security. By introducing the BioStation terminal, the Suprema Company aims at even further accuracy of its biometric technologies while presenting innovative functions created on the basis of practical experience. D-Station, the new flagship of Suprema, is a symbol of biometric technologies development. It challenges prejudicial restrictions and reacts to ever changing requirements in the security field. D-Station opens a new biometric era with its unprecedented performance and applicability. 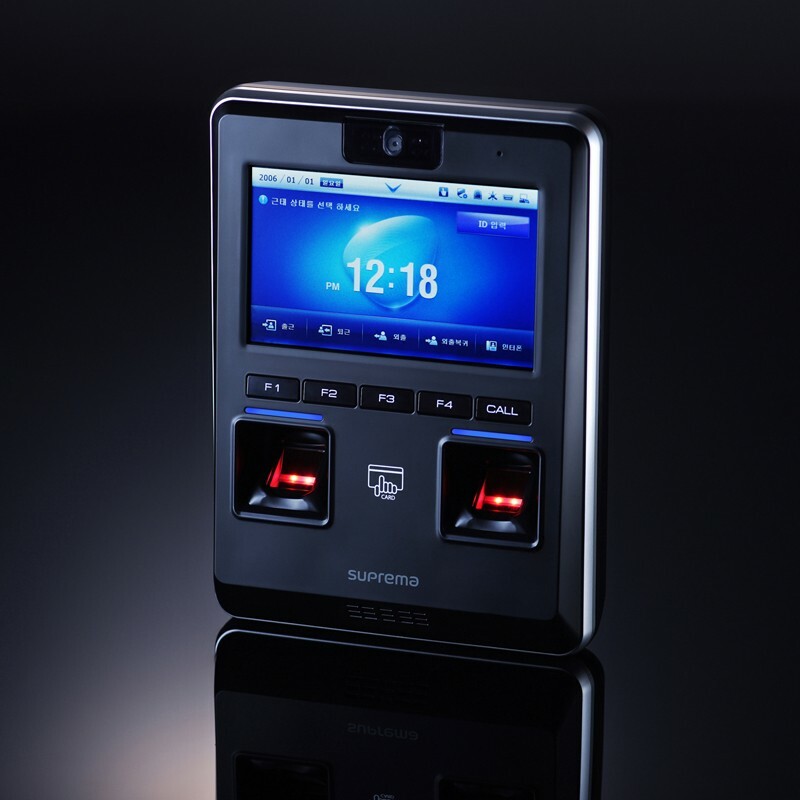 The patented Multi-Biometric Vision Technology (MBFT) created by Suprema is a revolutionary technology offering an exceptional performance far beyond the current biometric technologies. MBFT synthesizes and processes details from multiple biometric scanners and achieves excellent results in comparison with the current biometric technology of a simple regime. The new D-Station terminal uses the MBFT technology and so provides an unbelievable performance in biometric recognition – it combines fingerprint and face recognition. D-Station is equipped with two fingerprint scanners with high accuracy of scanning and a camera for face recognition, it offers various recognition regimes adjusted to the needs of the user. 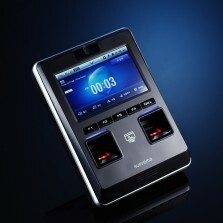 For biometric IP scanners operation, constant communication with the user is very important for many reasons. For Suprema, a clear communication interface was always the symbol of practical use and it is crucial for its appliances. Its design incorporates an ultra-wide LCD touch screen, LED indicator, sound signal and camera. D-Station offers a flawless function and clear interaction with the user. In the field of security, D-Station is characterized by significant features in every aspect. A high-performance Tri-CPU processor cannot be outpaced by any other biometric product on the market. 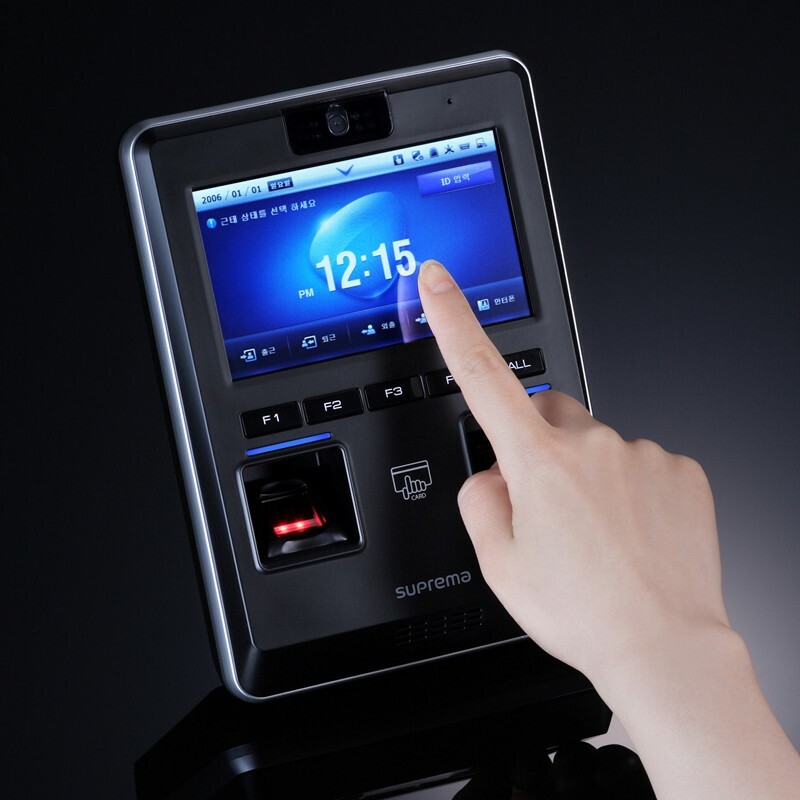 With D-Station, Suprema redefines biometric security. D-Station offers 3 specific authentication regimes – this creates a balance between security level and processing speed. By selecting biometric authentication methods, the user defines optimal performance depending on accuracy, speed and passage frequency. 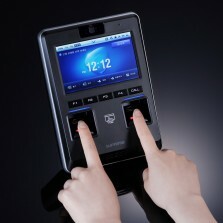 Multi-biometrical regime combines two-fingers scanning and face recognition using Multi-Biometric Vision Technology. This regime maximizes accuracy of user authentication. The Quick regime offers an incomparable speed of fingerprint verification. The combination of a famous fingerprint algorithm with a high-performance Tri-CPU processor that is capable of processing data from two scanners simultaneously offers an exceptional performance unmatched by any other biometric appliance you have seen. For a quick check-in of users (namely during morning hours or during shift changes the Twin regime offers a quick check by simultaneously processing two independent fingerprints in one appliance. D-Station is therefore capable of processing two rows of users – just like two independent terminals. All exceptional functions of D-Station are powered by a unique Tri-CPU system. The Tri-CPU parallel processing system functions enable D-Station to increase speed to correspond to a large amount of biometric data. Within the parallel processing a massive 1,4 GHz computing capacity is created by 667MHz performance and two 400MHz CPU. The capacity enables D-Station to bring exceptional performance in biometric computing as well as flawless operation thanks to its sophisticated functions. 5,0” WVGA LCD touch screen with 384.000 points, viewing angle of 140 and a touch screen. The display shows a panel designed to offer maximal serviceability and accuracy for a secure biometric access control added to a high-frequency attendance system Esthetic design of user interface of D-Station represents a revolutionary user environment. Intuitive control incorporates video telephone, adjustable wallpapers, video player, setting/management and personal messages. D-Station offers extreme flexibility for security system design and at the same time minimizes installation and maintenance costs. In comparison with conventional access control systems, the IP access system offers lower costs per 1 door with fewer cables – it uses current network infrastructure. D-Station also offers PoE and Wi-Fi, which also simplifies the installation. The PoE function also ensures a simpler cable system and lower installation costs. Users can also choose to connect D-Station with Wi-Fi interface and use the advantages of quicker installation reducing significantly the amount of work and costs. 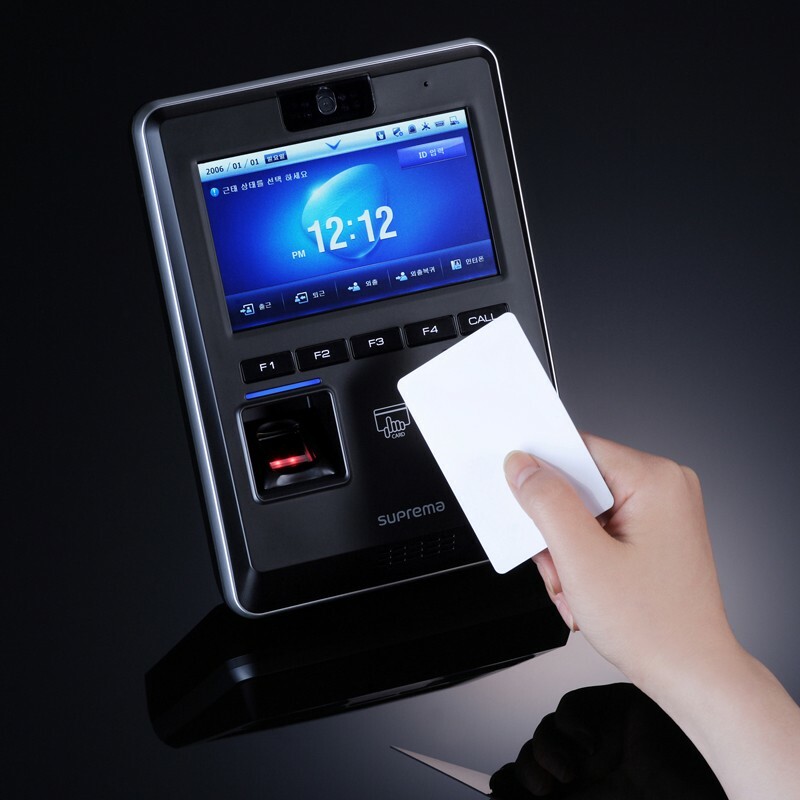 With its built-in 1,3 M pixel camera, D-Station offers a complex and fully adjustable biometric attendance elements. The appliance can record and assign biometric and non-biometric inputs from users using a camera for face recognition, fingerprints, sensor, display keyboard (PIN) and/or RF memory card scanner. The exceptionally simple user interface of D-Station offers easy manipulation and functions to users with minimal training and consulting required. D-Station can also be used as a door videophone and can display messages for users. D-Station brings many unique features and functions that increase the level of security and user comfort. Accelerometer (movement detector of the scanner with very high accuracy) is integrated to recognize any quake, manipulation or act of vandalism. Internal RF card scanner can also read ISO 14443 cards of A and B types. In addition, D-Station supports the SAM (SIM) card scanner, increasing application security. This function brings a way to integrate access with current cards used for intrastate ID and shipping, etc. To increase memory capacity, D-Station is compatible with SD memory cards. It also uses the RS232 interface compatible with GPRS/GSM network of mobile connection and serial printers for attendance data printing. Please send user inquiries for individual systems to the customer support centre. We perform complex delivery of our systems including analysis, installation, implementation and user training.